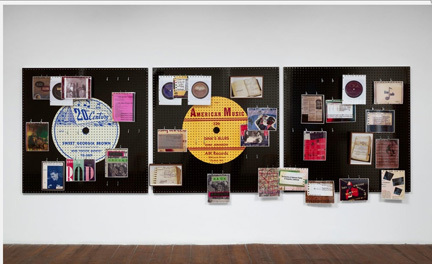 ARChive of Contemporary Music | ARChive of Contemporary Music, or "Would You Take My Mind Out for a Walk"
The history of jazz is a long, often-told story for which there are quite possibly over a hundred books. Here at the ARC, we have cataloged more than one thousand books that make reference to jazz in one way or another. In 2011, Oxford University Press published the second edition of a book suitably titled “The History of Jazz,” written by Ted Gioia. At 388 pages (not counting notes, indexes, etc. ), it is a very comprehensive story of jazz: how it was invented and developed; how it went through different phases of popularity; how it grew; how it fragmented into disparate styles; and finally, the state of jazz today. Having been an avid listener of jazz since the late sixties and having read many books and liner notes dealing with the subject, it can be said that, for the most part, Gioia gets it right. He tells all the key stories and recites all the biographies of jazz’s most important artists in an interesting and concise manner that keeps the story moving at an even pace. Gioia knows his subject well, and he explains it all with the enthusiasm and care that the subject deserves. Indeed, if you read this book, you will find yourself wanting to listen to the recordings that he mentions on nearly every page. Perhaps in the future, books like this will be coupled with a website where referenced recordings may be sampled by the reader. This would make it much easier for the attentive reader to understand what the author is discussing. However, Gioia gets two things wrong: one is rather major; the other is admittedly nitpicking on the part of this reviewer. Jazz began splitting apart in several styles most apparently during the forties. Traditional, Dixieland-style had become a cult. Swing was still the thing. Modern styles like bebop and chamber jazz were being played in the clubs. Gioia notes all of this. What he does not note is that rhythm & blues (thus, rock ’n’ roll) also developed out of the swing tradition. The most notable artist (not mentioned at all in “The History of Jazz”) is Louis Jordan. Jordan was an alto saxophonist and singer with the great orchestra led by the influential drummer Chick Webb. After splitting from Webb, Jordan’s small combo recordings were immensely popular and became the template for practitioners of jump blues, and subsequently rock ’n’ roll. The most obvious example would be Bill Haley and His Comets, which is basically a hillbilly act trying to be Louis Jordan and His Tympani Five. Other examples of rock ‘n’ roll having been an offshoot of jazz include Big Joe Turner, who sang with Art Tatum; and Johnny Otis, who drummed behind Lester Young. Indeed, Gioia’s knowledge of rock music seems to be lacking in other aspects, also. It is more likely that he does not care for it. When discussing jazz styles, particularly fusion’s mix of jazz and rock, the subject of The Brecker Brothers comes up. On page 331 Gioia states that Randy Becker “had played on the first Blood, Sweat & Tears album…” (a fact) but on the next page, when discussing the jazz-influenced horn section of the rock band Blood, Sweat & Tears, he states, “…recording of Billie Holiday’s ‘God Bless the Child’ from their debut album…” The song was actually on B,S&T’s second album, possibly confused by the fact that its title was eponymous. As stated earlier, this latter beef is nitpicking. The former beef, however, is one that is rarely mentioned in jazz histories, as if the authors do not want jazz to be held liable for what passes for rock music in the 21st Century. One can not blame them, but it should be noted here that jazz is even more directly responsible for a phenomena that is even worse than contemporary rock music: smooth jazz! 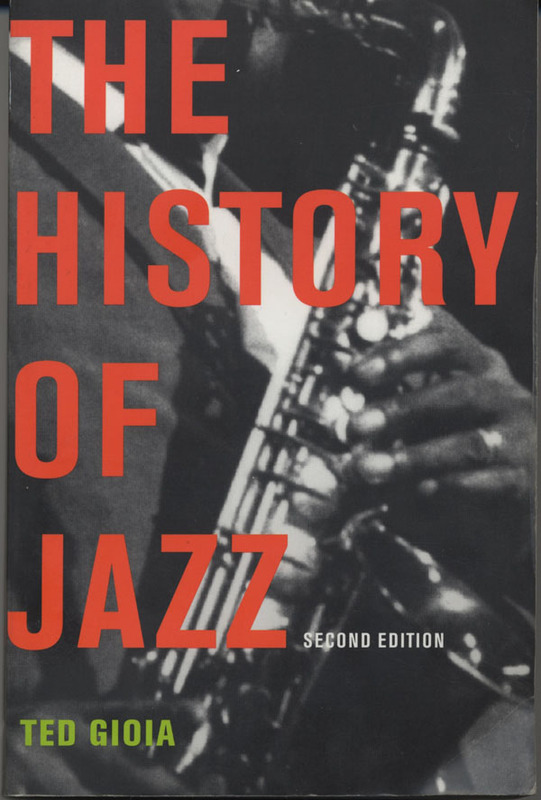 In all, Ted Gioia’s Second Edition of “The History of Jazz” is a wonderful read. Gioia’s love of the art form is infectious and reading it will send you to where ever you get your music from these days (record store, online store, youtube, etc) to listen to the titles he discusses. It will also send you to the bookstore to read more about the many fascinating characters a tome like this can only allow a few paragraphs to: Jelly Roll Morton, Art Tatum, Benny Goodman, Billy Holiday, Lester Young, Charlie Parker, Bud Powell… way too many to list here! If you only read one book on jazz in your life, this would be a good one. Read the book. Dig the music. Two things on the horizon over the next few days, to begin and round-out the MLK weekend. Once again I will be at the Balkan extravaganza that is GoldenFest. Its tonight, but I ‘m going tomorrow, Saturday January 18, 2014, 6pm-2am, when nearly 100 bands are supported by hundreds of dancers at the Grand Prospect Hall in Brooklyn, NY. Slavs and Slavias blur in this circle dance event, led by the not-to-be-missed Zlatne Uste big brass band. Tubas, Tubas, Tubas. A quieter moment of great beauty launches Saturday at 6:30 in the Chopin Room as The New York Spelmanslag offers schottis, hambo, polska, and pols from Northern climes. And there’s still time to get a ticket in support of the We Are Family Foundation Gala. This event is a project of ARC Board Member Nile Rodgers and supports building schools in Africa and teen initiatives. That’s this Tuesday, a soul-soothing way to round out the long weekend. 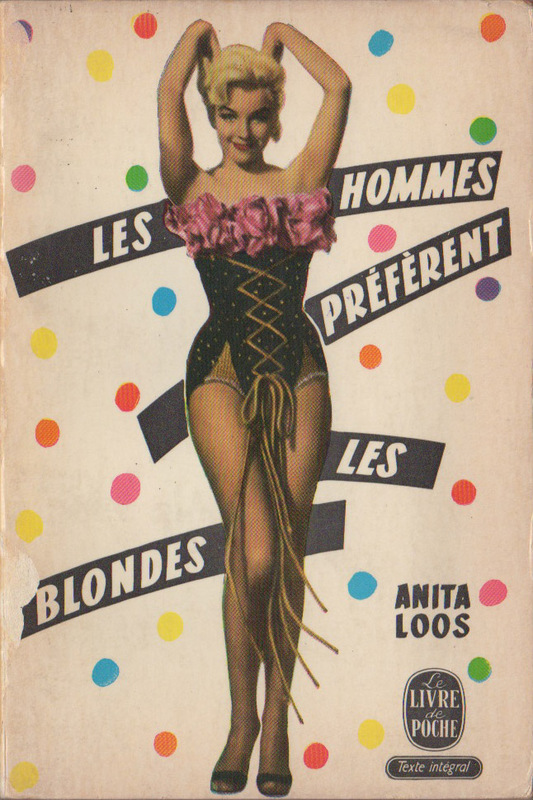 Back from Paris and have added a pile of new pulp paperbacks to my ouiouipulp.com page featuring French girl pulps, like this two-covered, covering all the bases take on the Loos novel that you probably never read, but perhaps saw. 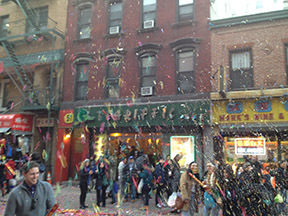 exhaling 2013 – inflating 2014! 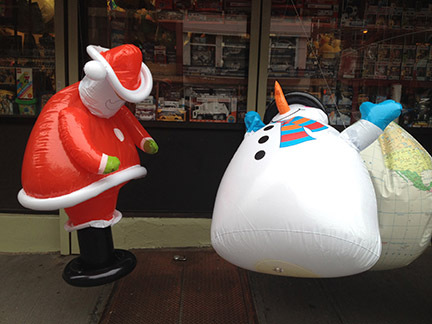 As we deflate 2013 and welcome 2014, a big thanks to all of you who supported the ARC! Don’t forget to mail that check you wrote last year, or post a donation for this year. What’s coming up? We will FINALLY update our website for easier access and more content. This year will be a lot of prep as we organize and plan for both Scandinavian Music Week and the ARC’s 30th Anniversary. Also more book scanning and the cataloging of recording #2,500,001! So lots to do and lots to look forward to. All the best from Bob, Fred and Quinn and all the interns and volunteers here at the ARC. You can contribute online via our NYcharities.org page (best for matching funds) or through paypal using the button below. 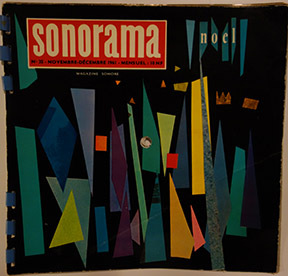 Keeping with yesterdays flexi theme, here’s another audio bauble, both plastic and Christmasie – the Nov-Dec 1961 issue of Sonorama (No. 35, includes text and 5 white, two-sided flexi-discs, 33-1/3rpm, France, 1960. Hole for playback drilled though entire package). 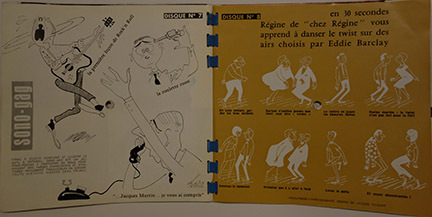 Aside from the format, graphics and ads (ie; everything) of interest here is the cut and dance instructions courtesy of Régine. 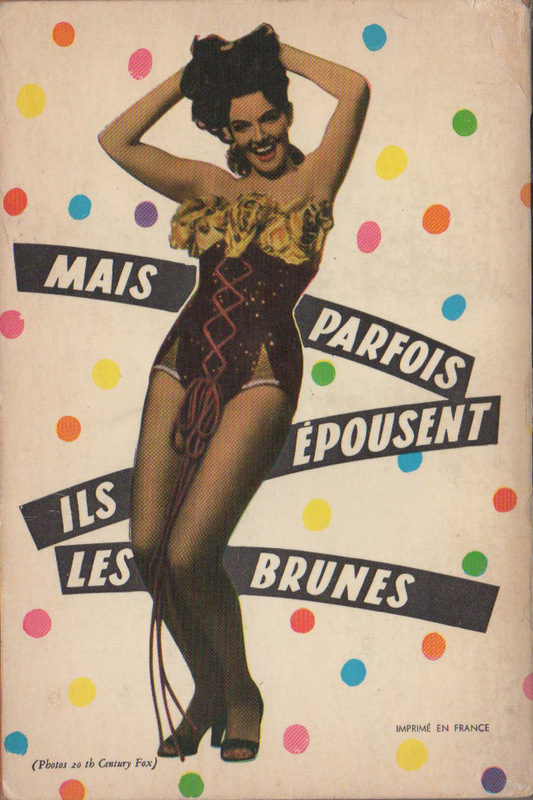 This Polish-born hostess with the mostest reigned over Paris nightlife from the 50s into the 60s, said to have coined the term ‘discothèque’ and first to introduce dual turntables into clubs. More research need here, but a very nice fleamarket find for a buck. Here’s the tracklist posted on the incredibly useful Discogs site. Our last night here we went to hear some jazz Manouche, or ‘Gypsy’ jazz a la Django Reinhardt @ L’atelier Charonne – a lovely evening with a jam session featuring a stream of talented, pencil-thin mustachioed guitarists. 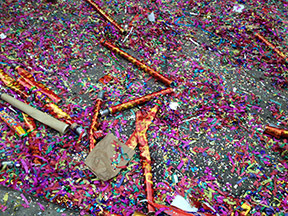 I now bid adieu to Noel, and Paris, and welcome la fête de Saint-Sylvestre (New Year’s Eve in France, the feast day of a 4c Pope) and prep for a just-off-the-plane Le Jour de l’An l’Amerique.